Fantastic news from our owners Osprey Management Group that they’ve secured agreement to operate a fabulous new venue based in Whitehaven’s iconic former bus station. To be named The Buzz Station, there’ll be a 100 seater cafe/bar on the ground floor and office space above. And we need YOU! We’re looking for great local suppliers who’d like to showcase their produce as part of our offering at the Buzz Station. If you’re an interested local supplier, you can sign up to join the mailing list and be kept up to date with developments here. ‘Craig Lowery, director of operations at Osprey, said: “We envisage The Buzz Station to be a unique proposition to the local area. Michael Pemberton, chief executive of BEC, said: “The development revives neglected places. Sellafield Ltd is investing £2.6m into the Buzz Station and the North Shore scheme is led by BEC, with the help of partners including Copeland Borough Council and Whitehaven Harbour Commissioners. 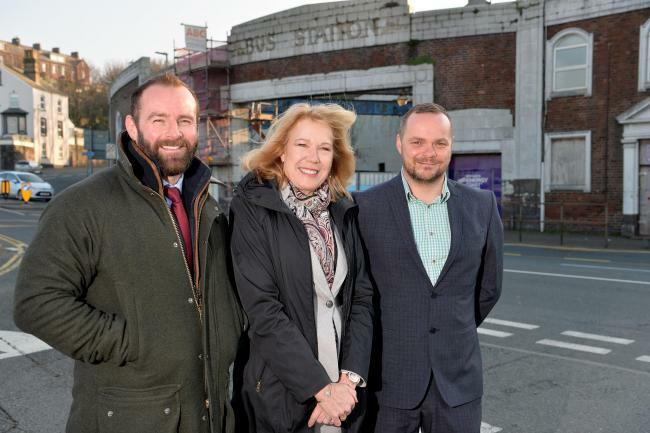 Image courtesy of the Times & Star shows Rob Miller of BEC with Osprey directors Lucinda Brown and Craig Lowery, in front of the development site.